Twinseal - Economical Carton Sealer Machine - Econocorp, Inc. Operator places loaded carton into the machine with the inner flaps closed and presses dual button start. Glue is automatically applied to underside of carton flap(s). Carton is elevated into vertical squaring/compression chamber. Completed, sealed cartons are automatically removed by the delivery chute accessory. 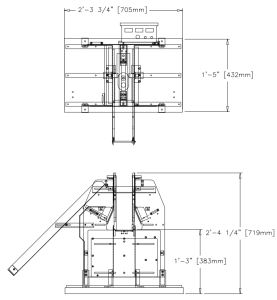 *The Twinseal can be quoted to handle cartons outside of range listed above upon request.